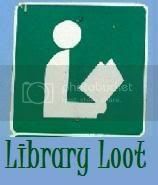 Wow, today's a busy day - a new review, a monthly round-up, and as I suddenly just remembered - I totally got library loot this week! First up, is The Hundred Thousand Kingdoms. The Booksmugglers went crazy over this book early on (it came out in the UK first) and good thing they did because I ended up being only 4th in line when I requested a hold on it. I love me some epic fantasy (and am planning an equally epic re-read of some of my favourites after my RITA challenge), and let me tell you I am already knee-deep in this book. Holy crap. SO GOOD. Second on the Loot list is The Duchess, the biography by Amanda Foreman that inspired the Keira Knightley movie. I loved the movie, even though Knightley is clearly sixty pounds too thin to play the Duchess of Devonshire but who CARES. The costumes, the scandal! I love reading history and wanted to boost my own historical research with some biographies so I thought I'd start with this. If any of you know some really interesting biographies of Georgian/Regency figures, please drop me a comment. That's about it for now, folks! The Hundred Thousand Kingdoms was my most anticipated read of...the year, maybe? The excerpt and the first few chapters had me absolutely enraptured, particularly that oh-so-evocative touch with the altarskirt rose. But as the story progressed, somehow, the narrative style grated a bit instead of being terribly impressive as it had been in the beginning. I also had a few problems with how exactly the God(s)-Yeine relationships were set up. I hope you enjoy it though. I loved the movie The Duchess, the book has been on my wish list for ages, hope you enjoy. My requests all come in at the same time on a regular basis! Enjoy your loot! If you're looking for good nonfiction Georgian/Regency, give PRINCE OF PLEASURE by Saul David a try. Great reading on the Regent, later became George IV. AnimeJune, I really, really, REALLY wish you'd consider also writing non-romance reviews. I also love me some epic fantasy, and sometimes even (*gasp*) non-fiction. Of course, they might not easily fit into your format, but I'm sure you're creative enough to work around that.